Dokdo Shown as Korean Territory in Japanese Textbook? Any expat who's spent a bit of time in Korea -- say, five minutes -- has already heard an earful on the Dokdo issue, those two rocks in the Sea of Japan (known to Koreans as the East Sea) that are claimed by Japan but possessed by Korea. Both countries point to maps as proof of valid possession, but the maps are often obscure and the arguments convoluted. Officially, my position is that Dokdo belongs to Korea. Unofficially, how would I know? I'm no expert. But to my relatively uninformed mind, Korea has a stronger claim, and for two reasons. First, when Japan officially declared Dokdo (which they call Takeshima) to be Japanese territory in 1905, they did so on the basis of terra nullius, namely, that the rocks were land unclaimed by any state, evidence that Japan was not basing its official claim on longstanding Japanese possession. Japanese textbooks from the late 19th century, written and published by the country's Culture Ministry at the time, indicate Dokdo as Korean territory, the Independence Hall of Korea announced on Tuesday[, noting that these] . . . textbooks -- mostly from the 1880s and some from the early 1900s -- prove that Japan's current claim over the islets is false . . . . "These books were written and published by the Japanese government at the time," said the Independence Hall of Korea institution, after unveiling five textbooks and two sets of maps of Japan to the public . . . . "This shows that the Japanese government did not consider Dokdo as part of their territory before Japan took over the islets during the Russo-Japanese War in 1905. This is another clear proof that Japan stole Dokdo even before it annexed Korea." A map in a Japanese textbook published by the nation's Culture Ministry in 1896 shows Dokdo as belonging to Korea. The shaded areas around the Korean Peninsula indicate Korean territory and Dokdo is shown within them. I see two different dates beneath the map: 1887 in Korean and 1896 in English. I am intending to post a blog entry on this textbook, so I need to know which date is correct. Also, does the textbook explicitly state that the shaded areas are national territory? I ask not to challenge (since I side with Korea on Dokdo) but to clarify. I tried from a different email. My wife then tried from hers. All three failed. So much for the Herald's openness to its readers. 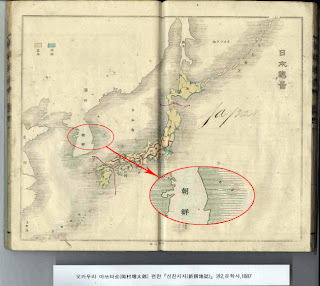 Meanwhile, the JoongAng Daily, in an article by Kim Hee-jin, "Old Japanese textbooks state 'Dokdo is Korea's'" (August 30, 2012), seems to clarify the date as 1887, for apparently the same map is depicted. Neither map identifies the island, so far as I can see, though the island definitely looks correct for Dokdo's position. But I'd still like to know for certain if the Japanese textbook with this map explicitly states that the shaded areas are national territory . . . 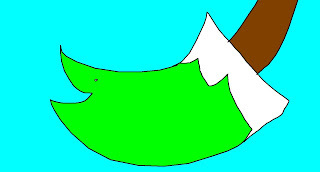 This drawing is called "Bird." I made this drawing because I like this bird head. The bird is very smart. The birds brain is bigger than a persons brain. The birds name is "bird." 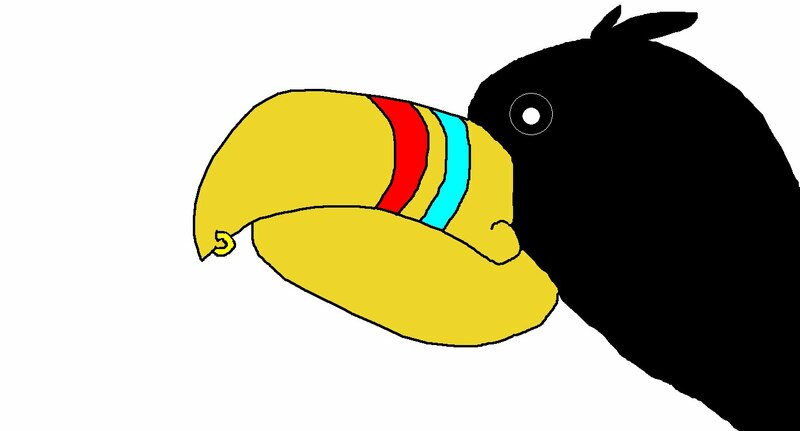 It has a very big beak. It will soar a lot. It might bite if you get close to it. This bird lives in En-ukistan, and it's 10 years old. It eats people (if it can). It is 10 feet tall, and it weighs 20 kg. It is very tall. It likes to eat cake. It can eat chocolate. It can't eat an owl. This bird was first born on a planet called En-ukistain. The planet is very big. It is bigger than Korea! Ha! Ha! The planet has a animal called En-Uk. 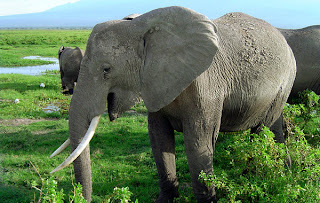 This animal is very strong and smart. It is stronger than any other animal in this world. It can kill any thing if it wants to, but because it is very nice, it doesn't kill people. Bye. This drawing is called "Fish Tree." I made this drawing because this is a mutant. It is half tree, half fish. 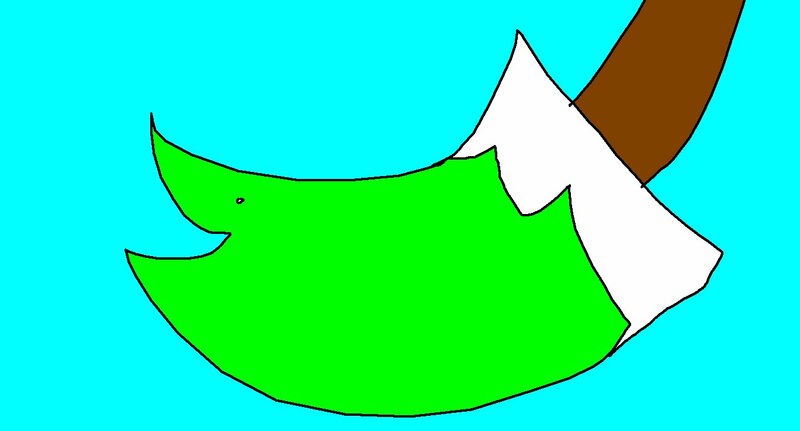 It likes to eat fish and trees. It is three meters long. It is as tall as a fish tree. It can be stronger than a person. It is big enough to kill a fish tree. It can be as strong as a fish tree. Bye. I see En-Uk is into tautological 'thinking.' Anyway, this tree is about the size of the bird in the image above . . . rather small for a tree, but quite large for a fish! These two images raise questions about the nature of art. The first is more visually interesting for me, but the second gains something aesthetic from its title, "Fish Tree." I'm not certain where to go with these points, however, except to note that Conceptual artists played with ironic titles, as did the Dadaists, . . . 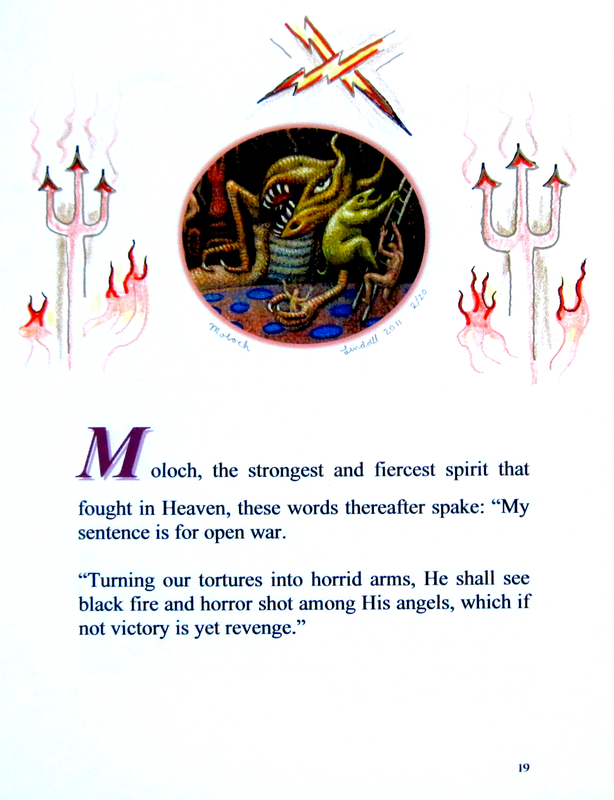 The Wickenheiser quarto is complete: 47 pages all with original ink drawings on the border. So I made a little movie set to Beethoven on some of the pages. Here's the YouTube link to that movie, which will take only six minutes of your time, clearly no inconvenience, especially if you like Milton or appreciate art . . . or both! I'm keeping this post short since a hurricane is currently passing over the Korean Peninsula, and though it's been downgraded to a tropical storm, the winds are rather gusty. See you all tomorrow! I hope . . .
For the longest time -- to borrow a useful cliché of exaggeration that Billy Joel made such fine use of -- I thought Verlyn Klinkenborg was a woman, and I liked 'her' writing so much that I made a point to read 'her' columns on "Language" carefully whenever they appeared, and always with admiration and interest. Last May, Ms. Soo Kyung Lee (aka Kathy Lee), assistant to director of my department, approached me with a proposal that I help develop a new writing course, and she described as paradigm a graduate course at Harvard taught by one of the editors of the New York Times, who also writes a column on language. Intrigued, since I read the Times daily and make a point of reading the language columns, I inquired about the name. "Verlyn Klinkenborg," she announced, naming the person under whom she'd studied. "Oh!" I exclaimed. "I read her columns." "No," Soo Kyung corrected, "you read his columns." I thus learned something important . . . and better understood the column's descriptions of hard farmwork and harsh wintertime chores, now that I knew that a man was describing those heavy lifting tasks. Soo Kyung kindly gave me Mr. Klinkenborg's email address and emphasized that he is very approachable. I've not written him, though, having little to say other than, "I like your column." Nothing newsworthy about that. Everyone likes his column, or everyone who counts and who undoubtedly knew his gender all along, so I'd only be embarrassing myself if I were to confess my ignorance in hope of justifying an email by providing him some amusement. Anyway, I read his most recent column yesterday and thought about the advice provided there. He posed a question, "Where do sentences come from?" Initially, I expected a sort of historical question in that query, namely, where the definition of a sentence -- as a paired subject and predicate that together express a complete thought -- originally comes from, i.e., where this concept happened to have developed historically. 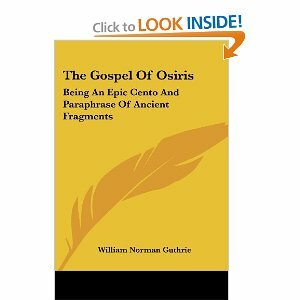 His answer, however, was not historical but metaphysical: sentences come from the mind, that origin, even organ, of thought . . . except that, echoing Gertrude Stein, he tells us, "There is no where there." Hence metaphysical. So experiment a little. Make a sentence of your own in your head. Don't write it down. Any kind of sentence will do, but keep it short. Rearrange it. Reword it. Then throw it out. Make another. Rearrange. Reword. Discard. You can do this anywhere, at any time. Do it again and again, without inscribing anything. Experiment with rhythm. Let the sentences come and go. Evaluate them, play with them, but don't cling to them. If you find a sentence you really like, let it go and look for the next one. The more you do this, the easier it will be to remember the sentences you want to keep. Better yet, you'll know that you can replace any sentence you lose with one that's just as good. I found this interesting because it's a technique I learned on my own, one that informs and forms my writing but that I cannot pass along to my students because English is not their mother tongue. It's otherwise sound advice . . .
Bob [Wickenheiser] asked me to embellish the 8 1/2 x 11 quarto edition that only had printing and no drawings on [the] border. I am using magic marker, ink and color pencil. As [fellow artist] Dario [Rivarossa] knows, using ink and magic marker requires a bit of perfection. The second you put the pen on paper it must proceed perfectly . . . like Mozart's [method of] putting down his compositions. One cannot erase. So far with about 30 of the some 40 pages done I have not made any of what I would consider mistakes. Here are some of the pages. I may work on these a little more. By the way, I am doing this extra work at no expense for Bob. It is a gift to a great scholar, a great collector, a generous human being and a transformational leader. A very unique and rare type of human. And besides, the quarto is going to the greatest collection of its kind. [T]his is only one of two copies of the quarto (as my elephant [folio] is only one of two), [such] that it and the elephant folio enhance substantively the focus of my Milton collection on illustrated Milton, especially illustrated P[aradise] L[ost], and, finally, [such] that the quarto and elephant folio editions are central to the substantial collection of original Lindall illustrated P[aradise] L[ost] and Lindalliana which I am fortunate to have in my collection. I might add that Terrance is playing a significant role in helping Professor Wickenheiser make his collection the very best with respect to illustrated texts of Miltonia and Paradise Lost by contemporary artists. 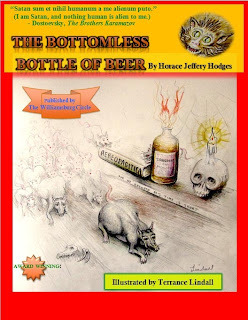 I'm hoping that Terrance's many illustrations for my story, The Bottomless Bottle of Beer, will also be included in Professor Wickenheiser's collection since so much of the story is inspired by Milton's Paradise Lost! Very nice. I like the tension between the bolts from above and the darker fire from below -- is that the divine-diabolical conflict? 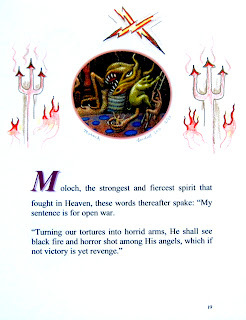 In this query, I was linking the dark-tipped pitchfork images to the words about "black fire . . . shot among His angels," to which would be opposed God's thunderous bolts, these also depicted, in the upper margin to the first image. The strains of music visible above the heavenly muse in the second image probably require no explanation,for this sizeable marginal image -- enhancing the yet marginally larger image on the page -- is self-explanatory and need not be harped upon. 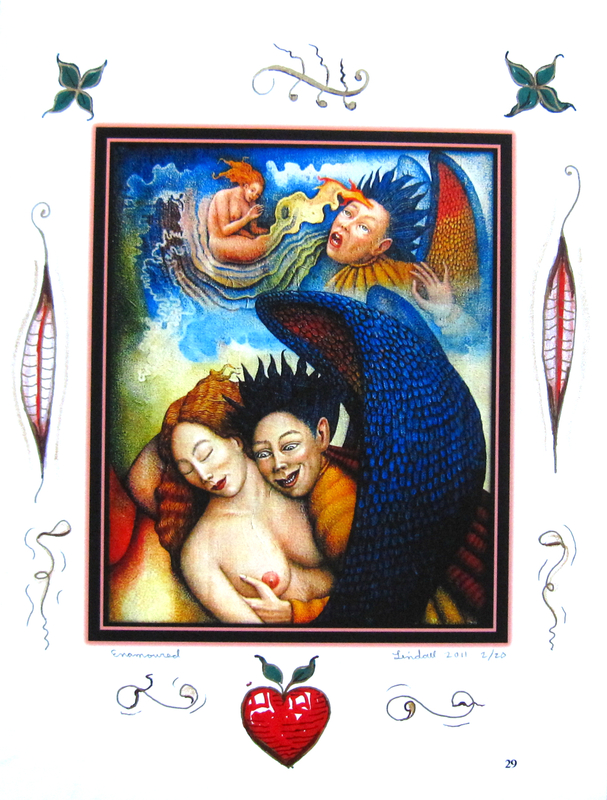 The third image -- of Satan and Sin in 'love' -- may require some liminal remarks, however. Atop the image, we see weird strains of music, along with four-leaved plants, followed in the vertical margins by strange pod-shaped depictions worthy of The Body Snatchers! Under these pods, both vertically and horizontally arranged, are more of those weird strains of music . . . or are these spermatozoa?! 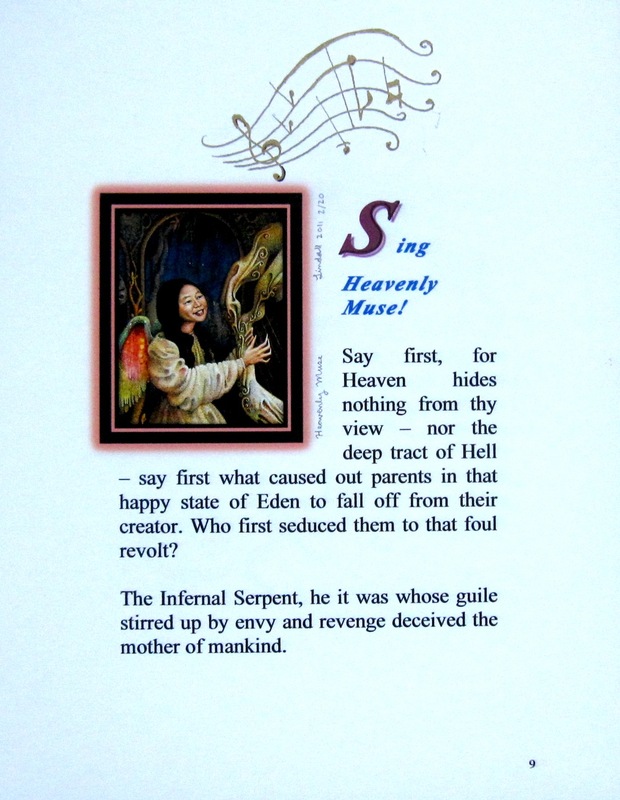 Is heaven playing their song? This is prior to the expulsion of the fallen angels, so they're all still in heaven, and we do see a passionate heart, as well as imagery showing Satan enamored of his lover, Sin, whom he's busy impregnating with Death. Thus . . . spermatozoa, dancing to "The Twist"? This relationship will surely end on a sour note, not least because Sin is Satan's daughter. Although my reading of the imagery may seem to fit, only Terrance can confirm, or disconfirm, its accuracy. I'd like to see the entire forty pages when Terrance has finished . . .
Getting Rather Far From Home . . .
Nice, poetic ending that leaves one wondering what will become of the protagonist, Bob Gifford . . . but perhaps these final words provide a clue. If we take the metaphor literally, an enormous, lumbering beast of darkness has swallowed Bob and his van! That sounds bad for Bob, but perhaps -- like Hercules within the gullet of the Hydra -- Bob will fight his way back out to face this new nemesis. And what will Bob confront? And he chained him limb by limb. And he gored him with his star-pointed spear. That shook the earth in a crazed anguish of fear. Like Heru, Bob will have a fight on his hands, but I believe our hero will prevail, and I eagerly await Shan's next novel for the epic details. Moreover, there's a lit-crit lesson to be learned here, namely, always take metaphors literally, and see if they lightly carry you toward an intertextual hermeneutic in a willing suspension of disbelief . . . Hitting Rather Close to Home . . . Gypsy scholars! I do believe my younger, but more successful academic brother was thinking of me! Reckon I was one of them there 'gradual' students "with no chance of getting hired." I ought to have read Shan's novel 32 years ago! But time travel hadn't been invented yet back then . . . not that the years should matter for time travelers like me. After all, I'm constantly traveling into the future, as time goes by, and repeatedly visiting the past, in my memories . 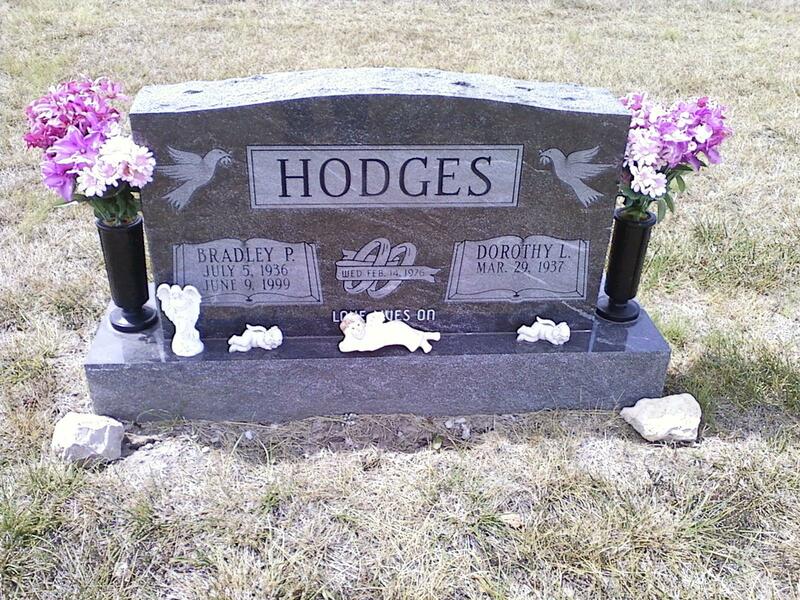 . .
Just before the graveside service [for Jarrell], Virginia and I located Bradley's grave, and here is a photo of the headstone that [Bradley's wife] Dorothy placed there: Virginia made this. I . . . recall his method of toughening me up for life and making sure that I became self-reliant. Only five years old, I was playing barefoot outside with other boys while my father stood talking to some neighbors who were laying concrete for their patio. A dump truck parked in their driveway contained sand for the cement mix, and as the day grew progressively hotter with the sun climbing ever higher in the sky, heating the streets, the sidewalks, the driveway, the ground, and the sand in the dump truck where I happened to be playing, the soles of my feet started to burn. I climbed down from the truck, burning my feet even more on its hot metal, and ran to my father, asking him to pick me up. He refused. "But my feet are burning," I told him, hopping first on one foot and then on the other. "Go home, put some shoes on," he retorted, not offering to help. I asked nothing of my father after that, which was perhaps his intention, and I grew up without his influence, which was perhaps not his intention. That last remark wasn't quite right, for he did press me rather forcefully toward self-reliance, and that's certainly an influence -- though the type of self-reliance he forced on me left him without other kinds of influence. Anyway, from the photograph, I see that his wife Dorothy is still living. They seem to have been married about 23 years when he died -- a happy marriage, I am told. So much of life's happiness depends upon finding the right partner, and my father appears to have found the right one after searching for a few years. I'm also told that his step-children liked him. I suspect he employed other methods for teaching them self-reliance. Odd, how things turn out, but as is said, life goes on . . . until it meets the leveler of us all. Avant garde surrealist artist Terrance Lindall recently convened a meeting of the WCIAL members committed to "Publishing for a New Age." 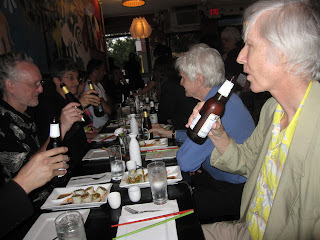 As you see, they gathered in a restaurant where -- or so Terrance informs me in an email with the above photo attached -- they toasted my story The Bottomless Bottle of Beer (BBB). The published book will of course be as much Terrance's as mine since some fifty illustrations of his depicting the ten characters will appear therein, bringing the novella to over 100 pages. Terrance is the distinguished-looking white-haired man in the near right of the photo, and therefore closest to the viewer. The other three members visible counterclockwise starting at Terrance's right are holographic artist Sam Moree, artist, musician, and filmmaker Peter Dizozza, and design artist Orin Buck. Also, in the lower left corner can be seen the aesthetic hand of electrifying painter and sculptor Bienvedo Bones Banez, a fifth member of the publishing team. BBB is a superb bit of work. I don't know if it is me -- and Jeffery and I have already discussed how the story affects people in different ways -- but, my goodness, if you go just below the surface and experience the story "out there" in imagination land, well, I find it very frightening. Isn't that curious? Anyway, as a piece of literary art, it covers all the bases. I caught a brief glimpse of a large red sign with golden Cyrillic script that must have read "Café Griboyedov," as Koroviev dragged me inside. The café was large, spacious, packed; my traveling companion seemed to know everyone as he grasped hands in greeting while we made our way to a table inexplicably free of patrons. I tried to focus on what the tall fellow was telling me about each individual he greeted but could scarcely hear above a loud, jazzed-up version of Leonard Cohen's "Hallelujah." And waiters! Griboyedov had waiters! Bearing trays laden with cups and saucers high above their heads, they pushed their way among the patrons, hoarsely shouting, "Izviní!" Dropping the ordered cakes and coffees down onto tables with a clunk, sweeping used cups, saucers, and silverware clattering onto their trays, dumping loads of used dish- and silverware roaring into sinks, shouting out orders for various coffees and cakes. In short, pandaemonium. The story is intertextual, alluding to other works of literature, often quite directly, and readers who've read Mikhail Bulgakov's famous novel The Master and Margarita will recognize the inspiration for this scene (and I'm indebted to Meergul of Kyrgyzstan, a waitress in Seoul's Craftworks Taphouse, for the Russian word "izviní," which means something like "pardon."). Anyway, you can read the anthology version later this year in IA's Emanations II, as noted above. WCIAL's "Publishing for a New Age" version will take more time since Terrance will want to work on producing the finest of illustrations. His standards are high, and he intends to finish fifty images, at the least. The book, therefore, might take another year or two . 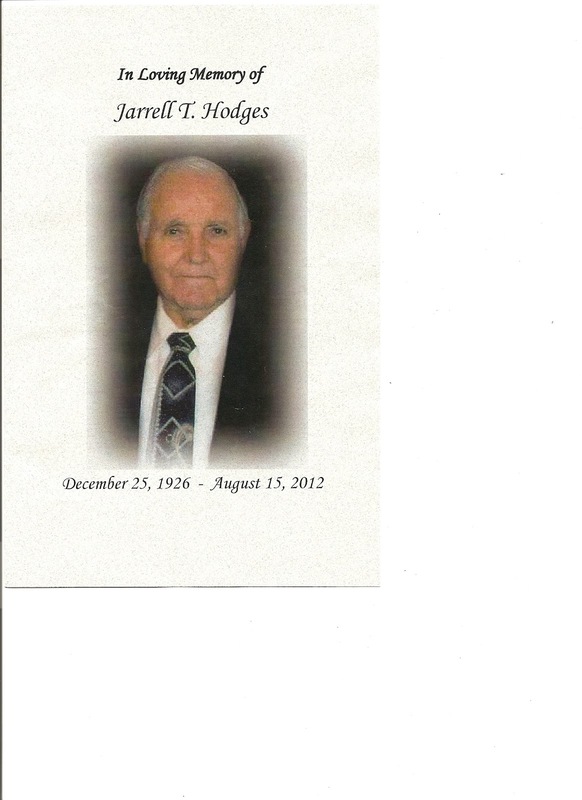 . .
Uncle Jarrell T. Hodges has passed on . . . When brother Jarrell came home from the military, he had a disconcerting habit of laying his loose change on his dresser. That was a terrible temptation for me and brother Bradley. It was actually less troubling for Brad, and he didn't mind helping himself occasionally. But I fought it for days . 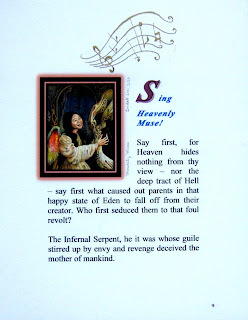 . . until one day greed overcame conscience, and . . . to my everlasting shame, I TOOK A DIME! I think I got a can of pop and an ice cream cone. But for days I couldn't look Jarrell in the face, as I knew my crime would be printed on my forehead for him to read. Over the years I was unable to overcome my guilt, so a few years ago I happened to travel through Kansas City on my way to take a plane to Washington, DC to visit son James and family. Returning to KC, and on my way home, I decided to clear my conscience. Stopping by to visit, I confessed my crime, pulled out a dime, and placed it on the table between my brother and me. Jarrell picked up the dime, turned it over and over in his hand . . . then returned it to me. Sorrowfully, he said, "Cran, that's not the same dime." 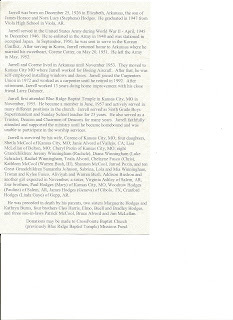 A large audience attended the 11:00 AM services of brother Jarrell Hodges at the CrossPointe Baptist Church, Blue Ridge Campus, at 10306 Blue Ridge Boulevard, Kansas City, Missouri on Saturday, August 18, 2012. I don't know the actual attendance, but the church would seat several hundred, and was about three fourths full. His former pastor, Brother Parker Daily, preached the funeral. 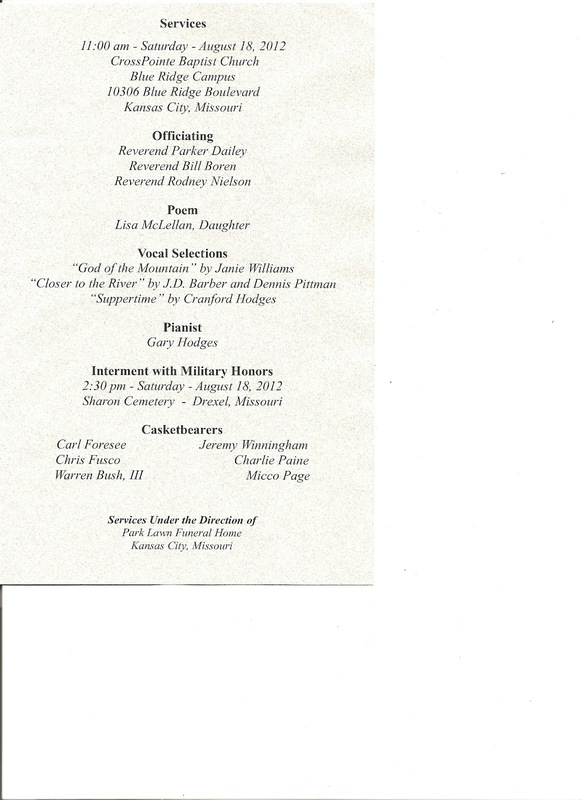 Present pastor, Brother Bill Boren conducted the service, opening in prayer, reading the obituary, and introducing the singers, and reading Jarrell's 1947 English II, Theme No. 1, as follows. (The paragraphs were indented on the brochure). To many people such a name as a favorite spot could only mean a place in dreamland, a Utopia, or something that never exists. But to me a favorite spot is something to cherish and a place that in days to come I can look back to with happy remembrance. It isn't one of those places that people look upon and admire, but to me it is beautiful. There are trees that in the springtime are so green they glisten and in the autumn they are of many colors. The grass that pushes its tender green stems upward in the spring turn brown and ugly in the hot summers and the cold winters. Many birds come to this place in the spring and to build their nests only to go away again when the frost begins to come. Some come to this place only to go away sad because of the loss of a mate or an offspring. Even though tragedy sometimes visits here, it is in reality wonderful. Some people could look at the surface features of this place and declare it ugly or maybe not take any notice of it at all. They might look at the long and crooked red gullies and say that negligence was the cause of this unwanted disgrace to the spot. The small stream of water that courses its way through this place sometimes seems to sing as it flows in and among the gravel bars and around the willows. At other times, it seems to be quiet and to hurry on by. Sometimes the wind sings and whispers of happiness as it passes through the lonely pines or through the stately oaks. But at other times it only sighs or just causes the trees to tremble as it is passing by. Even though me sadness and ugliness sometimes take the place of happiness and beauty, to me this place shall always be wonderful -- for it is my home. There were three songs: "Closer to the River" by J. D. Barber and Dennis Pittman, "Suppertime" by Cranford Hodges, and "God of the Mountain" by Janie Williams. His daughter, Lisa McLellan, gave a tribute to her dad, and quoted the words to the song, "Daddy's Hands." After singing "Suppertime," I related the story of stealing a dime from my brother years ago, finally confessing to the crime about eight years ago, and just before the service told how I had placed a dime in the small "memory drawer" inside his coffin, finally having closure to the incident. I think each of the children placed something there. I do know that Corene placed in it three small love notes (about 3 by 3 inches in size) that Jarrell had written her when they were dating. She showed them to me that morning. One was written as a poem. Following the service, the church fed the families and friends who stayed. 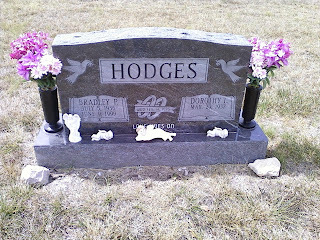 The graveside service was at Drexel, Missouri, at 2;30 pm, where his son in law was buried nearby, Brother Bradley was also previously buried in another part of the cemetery. 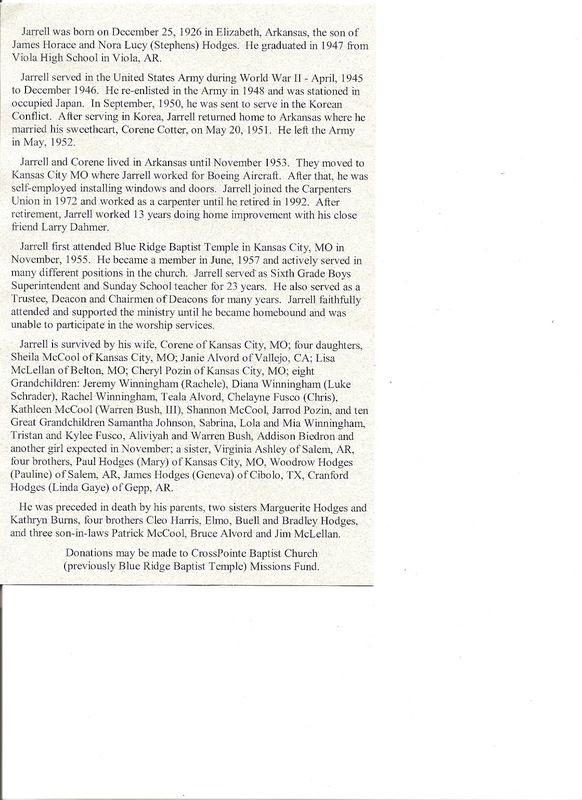 Jarrell was a veteral of the Korean war, and military rites were performed by an honor guard of four soldiers. The bugler played "Taps," three soldiers gave a rifle salute, and one soldier presented the U.S. flag to his wife, Corene. It was a touching and loving service to my brother. P.S. Some folks had tears in their eyes as I sang "Suppertime," but when I related how Jarrell examined the dime I tried to return to him, then shook his head, gave it back, and told me, "That's not the same dime," they laughed. But several told me later they enjoyed that story, and it illustrated his sense of humor. Today's WR [Weekly Ramblings report] is brief. I'm yet on a bit of a downer . . . Uncle Jarrell's passing was too soon after losing Dad. Life's not long enough . . . at one time I thought the Hodges were invincible . . . they're not. Jarrell's service reunited families again. Rev Dailey gave a beautiful eulogy . . . he and Jarrell (J.T. in Parker's words) were obviously friends. Uncle Cran sang "Suppertime," followed by the story of the stolen dime . . . that tale bringing smiles and laughter from to everyone. The world continues its slow spin, minus Dad, Jarrell, Kathryn, Buel, Cleo, and Brad . . . and once again, with no need to remind anyone . . . each, Heaven's gain. Following the services, Scott, Cheryl and I visited Uncle Claude . . . he's doing well. Those closest to us need a hug and an "I love you." From this eulogy, the Star's obituary, and the photograph at the top of this blog entry, I see -- and perhaps you've also noticed -- that Uncle Jarrell was born on Christmas Day. 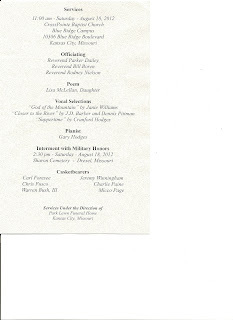 The eulogy also reveals that Uncle Jarrell was one of those individuals who serve their country and accept the responsibilities that life demands of us all, and he can thereby serve now -- now that he has passed on -- as a model for how one ought to live one's life . . . 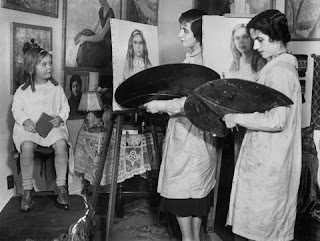 The paintings above by the De Hellebranth sisters might never have had much of an aura to lose, for they certainly lack any in this photographic reproduction, but if you go to the actual article and look at Bernstein's painting of Tamara Drasin, the first in the gallery series, I believe you'll agree that the aura of this painting is retained in its photographic reproduction. I realize Benjamin meant that an artwork that can be reproduced 'mechanically' lacks an aura -- and a photograph doesn't actually reproduce a painting -- but Leland and Eveleigh state that a painting's uniqueness, or aura, vanishes in the photograph, though they perhaps meant merely that photographs lack an aura. Perhaps someone more knowledgeable than I can clarify this point. An Exciting Scene from Shan's Novel . . .
Bob exploded from the hole like an NFL running back, his counter-attack catching the man completely off guard. Quickly, he brought the rock down towards the man's head. It was only [by] years of training and natural hyper-vigilance that the older man avoided being struck on the head. Jack ducked the dangerous blow, but still it landed squarely on his broad, right shoulder. "Oh!" he screamed, as much in surprise as pain. The force of the blow sent both the gun and rock tumbling away. The gun fell into a gap between the rocks, now unreachable both to predator and prey. Instinctively, the man grabbed Bob's right wrist with his left hand, and pulled out a knife with his injured right hand. His large hand swallowed Bob's wrist like a vise. "Damn it, hold still!" the man growled. Bob had no intent of obliging. It took all of Bob's strength and agility to remain upright and dodge the man's kicks. They moved around the clearing in a macabre dance. Bob knew losing his balance would mean death. Even with all his running, weight training, and martial arts experience, he could scarcely hold his own with the wounded man. "Who are you?" Bob demanded between breaths. Will Bob survive? Will he defeat 'Jack'? Will justice prevail? Or will the story end here on page 159? Most of you will never know . . .
Kim Kum-sun: Who was she? Many readers will recognize the name Claude Lanzmann -- French Resistance fighter, secular Jewish intellectual, heir to Sartre's existentialist legacy, leftist supporter of Israel, and director of the documentary masterpiece Shoah, a ten-hour film on the holocaust -- but who would have expected this man who has had so many lovers to reveal in his memoir that he has truly loved only one, a North Korean woman named Kim Kum-sun, with whom he never consummated his desire! Maybe that's why his love for her has remained so true. was posted, mute, but did not interfere. With passion, Claude and Kim embraced. Not having read the memoirs, I cannot vouch for the accuracy of Brosman's account, for she places the initial meeting in a hotel, though reviewers speak of a hospital. I like the poetic license, however, if that's what it is, and you can read the entirety of the poem, "Kim Kum-sun," in the literary journal Town Creek Poetry (Volume V, Issue 1, 2011). 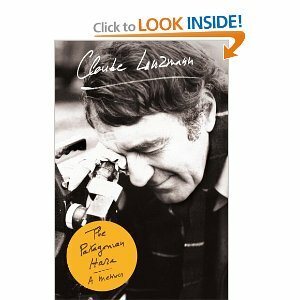 Perhaps Brosman's poem is more accurate, for she's an expert on French language and literature and read Lanzmann's memoir in the original French: Le Lièvre de Patagonie (2009). More prosaic accounts are available here and here, but they are based on the English translation. Intriguingly, one of the book's best reviewers, Paul Berman, does not mention the incident. A crucial question yet remains: Who was Kim Kum-sun? In 2007 he was briefly jailed for an attack on bar workers who had attacked his son in a drunken brawl. While his bodyguards watched, Mr. Kim assaulted one of the victims with a metal pipe . . .
Appa Gangland Style! As I recall, he was given a light sentence at that time because he had acted out of "love for his son," for everyone knows that the finest expression of fatherhood is to kidnap somebody who got into a fight with your son and beat him with a metal pipe! 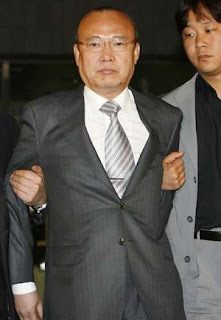 I showed the news of Mr. Kim's recent conviction for embezzlement to my wife, who remarked that she hopes his company doesn't suffer financially because we have insurance from it. Turns out, we're paying this guy protection money? I better keep my head down. Postscript (August 23, 2012): Just in case future readers miss the joke, the title of this post is a pun on the currently very popular song Oppa Gangnam Style. 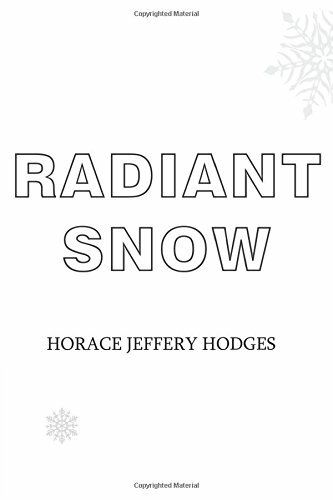 Snowy Scene from my Brother's Novel . . .
Bob woke at 5:15 A.M. and forced himself from bed. He had long ago learned that the secret to early workouts was in ignoring his body's protestations. Heating a cup of water in the third-hand microwave Steve had given him, he prepared for his initial caffeine fix. He had learned over the years that morning runs were the most efficient way of doing his workout. The weather "woman" on NPR -- actually a computer generated voice -- had accurately predicted snow. Glancing out of the window as he dipped his tea bag, he watched absently as large flakes blotted out the streetlight. He sighed and thought for at least the millionth time that coming to Minnesota very possibly represented the worst mistake in his life -- quite a statement, given his life. He finished the tea, stretched and, zipping his nylon running jacket on, headed out into the street. His old knit polyester red-and-white North Arkansas Pioneers cap, ugly as it was useful, kept his head warm. Beginning very slowly he headed for campus. The snow created a soft padding for his feet and at times it seemed he hardly touched the ground. Rounding the front entrance of the campus, he thought again just how beautiful the space was, like one of those water-filled paperweights with pastoral scenes. The orphanage school principal had such a scene on his desk. It had been the only concession to beauty the violent, corporal-punishment-loving man had possessed. The Biltmore College campus was in a small valley, surrounded by rolling hills and postcard-scenic Lake Chaska. The view today made braving the darkness and the elements worth every agonizing moment. Rounding the old, red-brick football and soccer complex, Bob picked up speed and shot through the parallel columns facing Armstrong Library. Losing himself in the workout, he almost failed to register the small sedan that was idling at the east entrance to campus. He paid it little mind when he entered campus. But, brushing back the cobwebs, it suddenly dawned on him: Why would a car be idling this early in the morning when nothing was open and there was no traffic? Subtly, he wound his path towards the Memorial Garden to generate distance. Like a large cat stalking prey, the dark, sleek car crept silently forward. Whoever it was sensed no reason to hurry. Bob kept his speed constant so as not to alert the driver that he was on to him. Unfortunately, his path led to the public library, where he would be in the open with the path flanked on both sides by steep hills, unscalable in the slick snow. Darting his eyes back and forth, he looked for options. Could he scale the tall snow walls and evade the car? Would the person have a gun? As he hugged the snow bank, partly obscured by the shadows of the dim light, his senses were on hyper alert as adrenaline coursed through his veins. The car sat silently idling despite the light being green, exhaust fumes billowing about. The iced-over windows gave the small, dark vehicle a more sinister look, like something from a Stephen King novel. For reasons he could not understand, Bob's legs propelled him forward. The car door opened slightly but offered no light as the dome light was evidently disabled. With no place left to turn he felt naked and vulnerable. As the door opened wide, a dark-clad figure stepped out, face obscured by a large hood. Bob feared his heart might burst through his rib cage. But, at that moment, a small dog on a leash scurried across the snowy pavement. Bob's eyes nearly bulged out in relief. Just someone with their dog. Jeez, I am getting paranoid, he decided, legs almost collapsing in relief. His pace slowed as he passed within ten feet of the pair. The tall, slim, shrouded, faceless figure in a fur-lined hood paid him no mind, as if such predawn encounters were common place. The hooded figure turned ever so slightly towards him but did not return the greeting. The large, hood-obscured face reminded Bob of a monk's cowl -- or that of an executioner. The small dog just peed into the snow embankment. If you like this scene, which reveals some of the thriller aspect of Shan's mystery novel, you might also like the rest of the story. Koroviev Utters a Curse . . .
"Consider me a thirsty desperado," Koroviev replied, heading for the tavern door and leading us within. The interior was dimly lit by whale oil lamps, but more patrons than one might expect were present despite the early hour. To the left of the bar at a table in the corner sat a covey of women, thirteen in all, clustered around a kettle of some sort of intoxicating drink, for they all looked flushed and happy, and they smiled at Koroviev, who bowed, but headed straight for the bar to order his drink from an ancient, deeply wrinkled crone he greeted as "Old Nancy." I followed out of curiosity and a repressed craving for some of the Shoggoth's in my bag, watching intently as he asked for a pint of Maudite on tap. 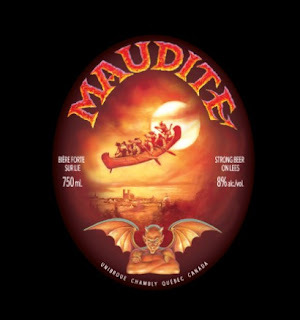 Noting my interest, he volunteered, "A hoppy French-Canadian beer, concocted by Unibroue, oddly, for they brew more than one beer." "You misunderstand, Koroviev," objected a husky voice from a shadowy corner. "The brewery's name expresses their motto, 'Drink less, drink better.' They brew several beers, but you need drink only one for satisfaction." "Not true, Behemoth," retorted Koroviev. "My thirst is insatiable." Surprised that the unseen voice had been addressed as "Behemoth," I focused on the dark corner, but could only make out something like a faded smile, which purred cuttingly, "You are then the exception that proves the rule." "I appreciate the exceptional compliment, Behemoth," he replied, "but I adhere to logic like a barnacle to a ship. I may be exceptional, but I must take exception. The proverbial folk wisdom is once again wrong. An exception, without exception, disproves the rule!" "Koroviev," came the soft hiss, "you continue to misunderstand. Generalizations are only generally true. By being an exception, you prove that a rule exists. I speak of inductive logic. I believe that you, Koroviev, are thinking of deductive logic, where an exception might very well disprove a rule." "An excellent response, Behemoth," conceded Koroviev. "Might I interest you in a Maudite?" Behemoth proves himself interested, and events take their course from there as the story's climax approaches, but you will need to obtain a copy of Emanations II when it comes out in a couple of months to discover what transpires (other than perspiration) . 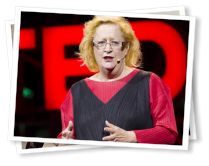 . .
Margaret Heffernan: "Dare to Disagree"
[R]ecently, I worked with an executive named Joe, and Joe worked for a medical device company. And Joe was very worried about the device that he was working on. He thought that it was too complicated and he thought that its complexity created margins of error that could really hurt people. He was afraid of doing damage to the patients he was trying to help. But when he looked around his organization, nobody else seemed to be at all worried. So, he didn't really want to say anything. After all, maybe they knew something he didn't. Maybe he'd look stupid. But he kept worrying about it, and he worried about it so much that he got to the point where he thought the only thing he could do was leave a job he loved. In the end, Joe and I found a way for him to raise his concerns. And what happened then is what almost always happens in this situation [in the West]. It turned out everybody had exactly the same questions and doubts. So now Joe had allies. They could think together. And yes, there was a lot of conflict and debate and argument, but that allowed everyone around the table to be creative, to solve the problem, and to change the device. So, how did she know that she was right? Well, she had a fantastic model for thinking. She worked with a statistician named George Kneale, and George was pretty much everything that Alice wasn't. So, Alice was very outgoing and sociable, and George was a recluse. Alice was very warm, very empathetic with her patients. George frankly preferred numbers to people. But he said this fantastic thing about their working relationship. He said, "My job is to prove Dr. Stewart wrong." He actively sought disconfirmation. Different ways of looking at her models, at her statistics, different ways of crunching the data in order to disprove her. He saw his job as creating conflict around her theories. Because it was only by not being able to prove that she was wrong, that George could give Alice the confidence she needed to know that she was right. And that's what we -- Westerners, Easterners, Koreans -- need to master, the art of disagreement! We need to accept the likelihood of being wrong -- and called on it -- for the unlikelihood of being right! The link given above is to a YouTube video, but some will be able to view the video directly on the TED site, where one can also read the transcript not only in English but also other languages, including Korean. When Bob Gifford takes up a one-year appointment as counselor at elite Biltmore College, Minnesota, he has no idea his life will soon be in danger. Okay, the hostility from most of his colleagues is evident from the outset -- as an orphan brought up in a boys' home, with degrees from obscure state colleges in Arkansas and Texas, he will never fit in to their privileged, blue-blood world. But it soon becomes obvious that workplace politics constitutes the least of his worries. One of his student clients dies in a car crash shortly after hinting that she has something to tell him about the recent, violent death of a professor on the Biltmore campus. Immediately afterwards, a home-made bomb explodes in Bob's apartment. Then he finds secret messages being left for him in the university library. Someone, or some organization, it appears, believes Bob is on the brink of uncovering a conspiracy. But what is it they think Bob knows? Who are they? And is he being encouraged to dig deeper or being warned off? Gradually he comes to realize he can trust no one -- not the college staff, not his landlord, and not the police. It is even too risky to confide in Steve Washington, the flamboyant black colleague and fellow "outsider" who has been almost alone in offering Bob friendship, or Janet, the spirited Jewish woman with whom Bob has a tantalizing on-off relationship. And just when a new appointment in back-of-beyond Texas appears to offer an escape route, Bob comes closer than ever to death. City of Shadows combines the qualities of a superior thriller with a deep understanding of human nature and insights into the claustrophobic, competitive world of academe. With as many twists as a mountain road, and set-piece confrontations that would have made Hitchcock proud, it is as entertaining as it is compelling. Well, I also find it compelling . . . though I'm his brother and am thus not entirely objective even if I do have high standards. The plot is complicated, which is why I'm happy for the chance to re-read the story, but the characters are clearly delineated, and the dialogue is often snappy, and witty enough at times to make me laugh out loud. At nearly 500 pages, it's long for a mystery novel -- or is it a thriller, and if so, is it long? -- but it sustains my interest as the layers peel away to reveal ever deeper levels of corruption and danger. Readers interested in this genre are invited to give it a try, as are readers of literature generally . . .
Sa-Rah excepted, for she preferred sighting Seoul sites, our family took our own 1 Night 2 Days (cf. 1박 2일) vacation last week east of Seoul, in and around Cheongpyeong, where we were greeted by the locals in a friendly, smiling manner. En-Uk stood undaunted in the face of such fierce friendliness, and returned the smile. We took a walk along that road where we'd received such a lively greeting. After a change of clothes, a walk along along a more distant road, intent on hiking up a small mountain. We took the 'broken bridge' crossing to the mountain side of the stream. Halfway up the mountain, we stopped, looked down upon the reservoir formed by Cheongpyeong Dam, which supplies drinking water for Seoul but is currently threatened by green algae due to a paucity of rain. One day and another change of clothes later, we drove around on Nami Island, which has playfully declared itself independent of Korea and called itself the "Republic of Nami," but I didn't see a national assembly, so it doesn't appear to be a democracy. Indeed, I saw no evidence of government, so the place is perhaps an anarchist state . . . if that's not an oxymoron. Although the Republic of Nami lacks a government, it does have a national religion, for its people worship the Truly Great Big Mother. She's nourishing her two children and seems unconcerned that the one standing is also relieving himself on her feet! Here, you see their size, compared to En-Uk and me. En-Uk, impervious to the fear and trembling that otherwise accompanies encounters with "The Holy," thinks this is all very amusing and takes liberties with the idolatry, but I expected no less from a boy undaunted by a stone-strong tiger! And that was this simmering summer's short vacation, with photos by my wife, who's camera-shy only in front of a camera . . . In the wake of the Asian financial crisis and of a continuing neoliberal [i.e., classical liberal economics] trend in higher education reform that emphasizes deregulation, competition, and marketization, the Korean government has attempted to minimize the country's educational trade deficit by pursuing measures that discourage students from studying abroad while encouraging foreign students to come study in South Korea. In effect, this policy shift underscores the need to raise educational and research standards at Korean universities and to create campuses with more international settings so as to better accommodate foreign students. One consequence is the emergence of international colleges housed within Korean universities that adopt a Western liberal arts model and are conducted entirely in English. Stephanie's Fulbright research provides an anthropological analysis of an international college that examines how various university stakeholders navigate their professional activities in the context of the university. It takes the integration of liberal arts education in South Korea as a point of entry to discuss the social, economic, and political debates surrounding university internationalization. Her presentation ultimately argues that the emergence of international colleges reflects a unique model of university internationalization that embodies the Korean attitude towards globalization. There wasn't much anthropological analysis in the presentation -- not what I think of as anthropology, anyway -- so I'm assuming Ms. Kim saves that for the thesis itself, but the data and her argument were interesting to reflect upon, especially for a man such as myself who has taught so long in Korea, first in 1995/6 and then from 1999 through 2012, and who has ever attempted to "navigate . . . professional activities in the context of the university" systems where I've taught, with varying success among seven universities (portmanteau for "unique adversities") as I've trod the faultline between academic cultures East and West. Ms. Kim's succinct summary of "the Korean attitude towards globalization" in "university internationalization" clearly articulated the point that each international program set up in Korean universities to train students in critical thinking (often taught by foreign professors) has mostly been sealed off in a 'bubble' from the rest of the university, the intention being to prevent critical thinking from being turned upon the larger university system or the even larger Korean society, where hierarchy and Confucian ethics hold sway. As example, Ms. Kim related an anecdote about one of the first graduates of Yonsei's Underwood International College (UIC), a woman who was interviewed by a national newspaper here in Korea and was asked about the UIC program. She answered the various questions honestly, using the critical skills in which she had been trained at the UIC, so she had both positive and negative things to say. Later, the dean of UIC called her personally and told her that before she gave any further interviews, she should first check with the UIC administration about what to say. That kind of demand would almost certainly not happen in a Western university, else the administrative official would be laughed out of office! But it's the sort of reaction still to be expected here in Korea . . .
Much Upon A Time . . .
Much upon a time, I didn't read the book . . . just a book review. One reader who happened upon my blog once castigated me for discussing a book I hadn't read. I make no apologies for that blog entry. I was discussing the review specifically, not the book directly. I can't be bothered to read every book that gets published! There are several surprises about stories. The first is that we spend a great deal of time in fictional worlds, whether in daydreams, novels, confabulations or life narratives. When all is tallied up, the decades we spend in the realm of fantasy outstrip the time we spend in the real world. As Gottschall puts it, "Neverland is our evolutionary niche, our special habitat." A second surprise: The dominant themes of story aren't what we might assume them to be. Consider the plotlines found in children's playtime, daydreams and novels. The narratives can't be explained away as escapism to a more blissful reality. If that were their purpose, they would contain more pleasure. Instead, they're horrorscapes. They bubble with conflict and struggle. The plots are missing all the real-life boring bits, and what remains is an unrealistically dense collection of trouble. 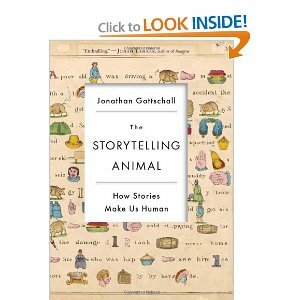 Trouble, Gottschall argues, is the universal grammar of stories. [S]tory's role is "intensely moralistic." Stories serve the biological function of encouraging pro-social behavior. Across cultures, stories instruct a version of the following: If we are honest and play by the social rules, we reap the rewards of the protagonist; if we break the rules, we earn the punishment accorded to the bad guy. The theory is that this urge to produce and consume moralistic stories is hard-wired into us, and this helps bind society together. It's a group-level adaptation. As such, stories are as important as genes. They're not time wasters; they're evolutionary innovations. There are exceptions, Gottschall allows, but they only prove the rule. I wonder what the exceptions are, and how they 'prove' the rule. Anyway, what do I take from this review? Trouble . . . is the universal grammar of stories. I knew that already, but the point is memorably phrased . . . though why "grammar" and not "syntax"? Sure, stories often utter a "What-big-teeth-you-have-grandma" line, but that's merely the moralistic sin tax! Sorry, but I couldn't resist . 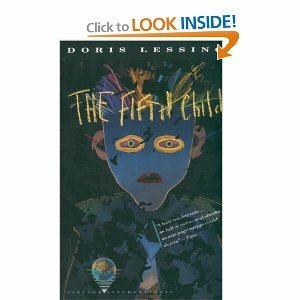 . .
Doris Lessing's Fifth Child . . . But if Ben was in the room, the dog watched him carefully and went to lie in a corner, his head on his paws, stiff with attention. One morning when people were sitting around having breakfast, Harriet for some reason turned her head and saw the dog, asleep, and Ben going silently up to him in a low crouch, hands held out in front of him . . . "Ben!" said Harriet sharply. She saw those cold eyes turn towards her, caught a gleam of pure malice. The dog, alerted, scrambled up, and his hair stood on end. He whined anxiously, and came into the part of the room where they all were, and lay down under the table. Ben is only three years old. His parents, Harriet and David, are an old-fashioned couple who get something rather more old-fashioned than they expected with the fifth child. Not a novel for everyone, but I managed to quell my anxiety and read on to the end, and I now can't get the story off my mind . . . The article doesn't actually claim that Elephants "talk," though it does say that they "communicate," but from what I've learned recently about elephant intelligence, as well as the size and complexity of the elephant brain, I wouldn't be surprised. Yesterday [August 2, 2012] we had a lot of wind, and some rain. About 5:30 p.m. the wind blew so hard we thought it sounded like a tornado. A lot of trees and barns [in the area] blew down. 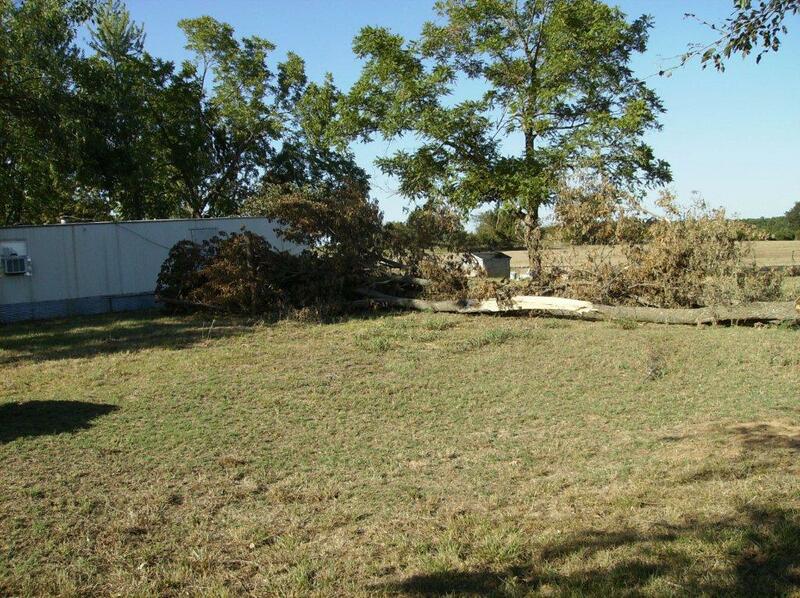 The ash tree behind the [storage] trailor . . . [had] two big limbs [blown] off and they knocked down the pole with the meter to our well, and the line was on the ground. It also blew one of the turbines off the roof. I went today to get wiring and conduit to run from our house. 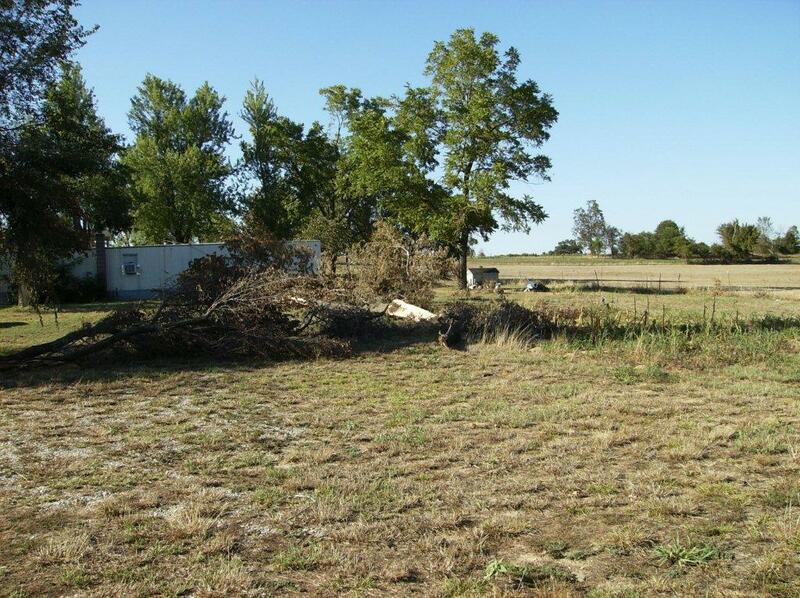 Tomorrow [Gay's cousin] Edmond [Fore] is bringing his Bobcat with a backhoe on it to dig the ditch [for the new line]. Bill and Audrey Young had a tree that fell on the house and tore part of the roof off, with lots of water damage. We did get .5 inches of rain during the storm, and another .3 during the night. That was our biggest rain since April. The wind last Wednesday (about 5:30 p.m.), sounded exactly like the tornado of 1982 that wiped us out except for the clothes we were wearing. There was a terrific roar, the house was shaking, we thought the house would go at any moment. Gay and I were both praying out loud. The power went off and stayed off until 6:00 a.m. on Thursday. There were several people who said they saw a funnel in the air below this same cloud. It demolished a boat dock on Bull Shoals Lake before it hit us. After things calmed down I went outside. Tree limbs were all over the yard. 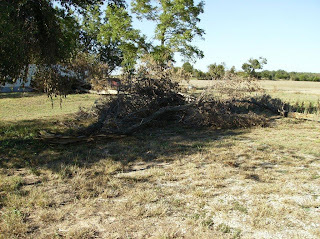 I walked behind the trailor house across the driveway, and there were two big tree limbs that were ripped off the ash tree, and they had demolished the meter loop that fed our well, and ripped the line to the ground from our outside night light all the way to the transformer, so we were out of water. Thursday, we bought a new breaker box, electric wires, and conduit, and on Friday Gay's cousin Edmond Fore brought his Bobcat with a backhoe attached. We spent the day hooking up from our house load center to the well. By 6:30 p.m., we had water once again. I told Gay that I might as well wait until Saturday night to take a shower! But she changed my mind rather quickly. One lady who grew up like my family without running water and electricity was asked about the one thing she would never want to do without again, and her reply was "Running water in the house." I agree. Of course, A/C [the air conditioner] would run a close second. Jeffery, there were two large limbs from the ash tree and one from an elm that fell close together. I have already cleaned up the limbs from the rest of our yard. I'll send a couple more [photographs] from another angle. These are the two limbs from the ash tree that demolished the utility pole from the transformer. It had the meter loop, meter, and load center box attached. I shoved the limbs off the pole, [which] . . . is lying on the ground on the other side of the limbs. Jeffery I mis-labeled [that] photo . . . . It was a photo of the elm limb, about like the other one. Here are the two elm branches that demolished the utility pole with all the attachments I mentioned in [the other message]. I learned today that there were 9 supercells in the area Wednesday afternoon. The one that came over us didn't actually have a tornado on the ground, but several other people had barns destroyed, trees on houses, and other damage. At least three people reported a funnel cloud in the air. The roar we heard was likely the funnel just over us. The wind was really raging. It was pretty scary. And scarier with each retelling! Here's the photo of the elm branches . . . or were they ash branches? The hilltop farm looks peaceful now, but I know how scary an Ozark storm can be, and I'm thankful Uncle Cran and Aunt Gay are safe. Nine supercells could easily have done far more damage! They're lucky the Ozarks are a low-lying plateau, else the funnel might have struck their hilltop farm more directly! Alawite versus Sunni: Spillover into Turkey? When I lived in Germany, I became friends with a Turkish Kurd named Memo who belonged to the Alawite minority, about 15 to 20 million (sic. see update below) of the Turkish population. I noticed from the start that he was a very liberal Muslim, but I eventually came to see that most Muslims -- or most Sunnis, anyway -- wouldn't consider him Muslim at all. At one point, he confided that the Alawites considered the Christian "Sermon on the Mount" as sacred scripture. 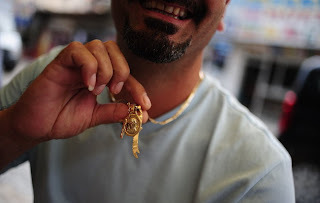 Note the above photo, which shows an Alawite combining Christian and Alawite iconography. As Syria's civil war degenerates into a bloody sectarian showdown between the government's Alawite-dominated troops and the Sunni Muslim majority, tensions are increasing across the border between Turkey's Alawite minority and the Sunni Muslim majority here. Many Turkish Alawites, estimated at 15 million to 20 million strong and one of the biggest minorities in this country, seem to be solidly behind Syria's embattled strongman, Bashar al-Assad, while Turkey's government, and many Sunnis, supports the Syrian rebels. The Alawites fear the sectarian violence spilling across the border. Already, the sweltering, teeming refugee camps along the frontier are fast becoming caldrons of anti-Alawite feelings. The Turkish government is led by an Islamist-rooted party that is slowly but clearly trying to bring more religion, particularly Sunni Islam, into the public sphere, eschewing decades of purposefully secular rule. Alawites here find it deeply unsettling, and a bit hypocritical, that Turkey has teamed up with Saudi Arabia, one of the most repressive countries in the world, and Qatar, a religious monarchy, both Sunni, to bring democracy to Syria. The Alawites point to the surge of foreign jihadists streaming into Turkey, en route to fight a holy war on Syria's battlefields. Many jihadists are fixated on turning Syria, which under the Assad family's rule has been one of the most secular countries in the Middle East, into a pure Islamist state. The Alawites here [in Turkey] are worried they could become easy targets. Historically, they have been viewed with suspicion across the Middle East by mainstream Muslims and often scorned as infidels. The Alawite sect was born in the ninth century and braids together religious beliefs, including reincarnation, from different faiths. Many Alawites do not ever go to a mosque; they tend to worship at home or in Alawite temples that have been denied the same state support in Turkey that Sunni mosques get. Many Alawite women do not veil their faces or even cover their heads. The towns they dominate in eastern Turkey, where young women sport tank tops and tight jeans, feel totally different than religious Sunni towns just a few hours away, where it can be difficult even to find a woman in public. He was sitting in a cafe in Antakya, a border town with a large Alawite population, and digging into a plate of baklava during the bright, sunny hours of the afternoon, when Muslims observing Ramadan usually fast. "Look at my people," he smiled, spreading his hands wide and encompassing families eating ice cream and one young couple nuzzling on a couch. "My people are free." He means free from sharia, and he's right . . . for now. UPDATE: Long-time reader Erdal points out that Mr. Gettleman has conflated Alawites with Alevis, and I was careless enough to neglect fact-checking. The Alevis number 10 to 20 million, mostly in Turkey. The Alawites (or Alawi) number about 2.5 million, mostly in Syria. I knew of the two different groups, but not of the relative numbers.